Dowry harassment doesn’t shock our insensitive psyches much, unless the in-laws resort to something heinous as bride-burning. We have accepted the unlawful practice of dowry as a way of life. Bureaucrats to business badshahs – everyone demands or delivers the pound of flesh. On some Delhi road-dividers you will find small dangling boards which state the other side of the story. Tormented men of the world unite. 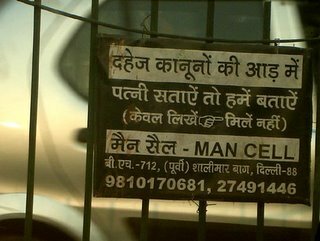 Direct your woes to Man Cell. Only write, don’t meet.